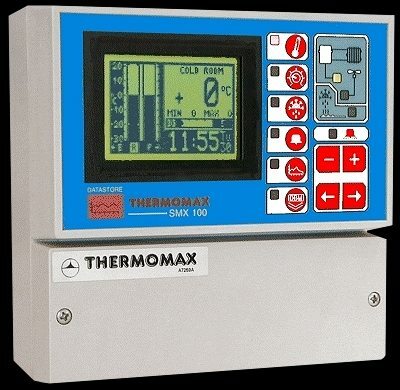 The SMX 100 microprocessor-based system with 3 fully sealed plug-in PT100 platinum film sensors uses modern technology to ensure that the cold-room is controlled and monitored with the greatest of ease. The large graphics LCD display communicates the information to the user with clarity, making programming and setting up friendly and uncomplicated, without compromising its sophistication and digital accuracy. The datalogger uses the novel approach of a paperless logging and filing system, which allows the data of any day in its history to be read and examined with just a few key presses. Cold-room, product and evaporator temperature view. 50-year clock / calendar withbattery back-up for up to 1 hour mains fail. Cold-room temperature set in 1°C steps from -50°C to +50°C. Cold-room thermostat differential in 1°C steps from 0°C to 10°C. Compressor switching delay (limited for avoiding short-cycling) from 1 to 99 minutes. Fan enable temperature for inhibiting fan when evaporator is still warm after defrost. 12 Cycles of defrost (arranged in two groups of six, with independent duration, termination temperature and dwell period for each group). Manual defrost activation and override. Alarm high and low first stage threshold temperature adjustable in 1°C steps from -50°C to +50°C with independent delays adjustable in 1 minute steps from 1 to 99 minutes. Alarm high and low second stage limits adjustable in 1°C steps from -50°C to +50°C. Alarm mute and reset facility. Alarm relay output with 5A isolated (volt-free) changeover contacts. Status screen for indication of system state. Alarm history record for low alarm, high alarm and mains fail. Battery back-up for mains-fail operation. Paperless datalogger with automatic filing by date. Product temperature sampled and stored every 15 minutes. Defrost and alarm state sampled and stored every 15 minutes. Contents of internal databank can be transferred directly to the PC using the MASTERLINK Software or via a MASTERLINK 2.0 Hardware module. 'Percentage of internal databank used' indication in bar graph and digital form. 'Internal databank almost full' indication with 3 weeks notice before data transfer is necessary. 2.5 Year internal reusable databank for datalogging.